And now, the second part. Textile softener. Laundry softener Blux Cherry & Magnolia 4l. You can buy it for 5.46 €. I buy it because it is big and cheap. WC Cistern tabs. 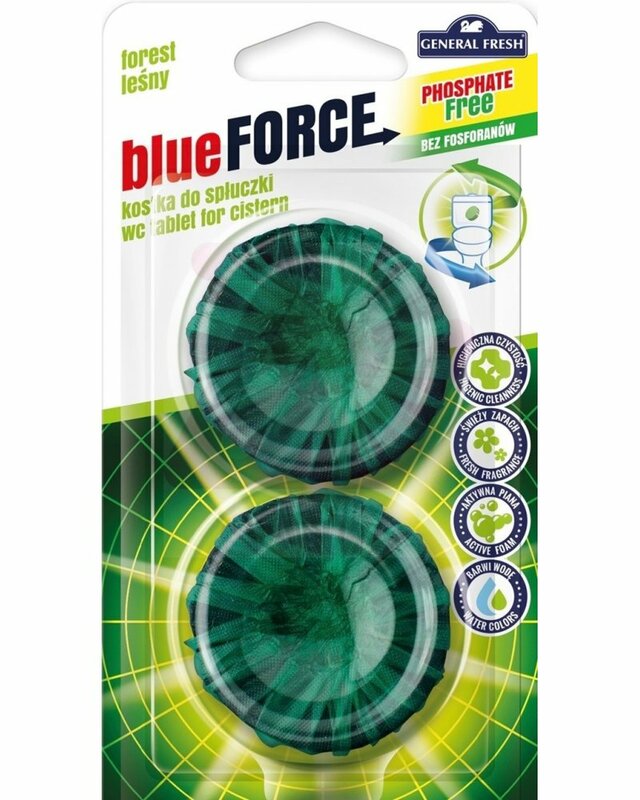 General Fresh Blue Force Cistern toilet cube 2 pcs. One cube lasts approx. 1 month. Laundry powder. SOFT “BLUE OXYGEN” washing-machine powder detergent with active oxygen - 15 washings . This washing powder does the job. I got it as a free gift when I was shopping online. It lasted more than only 15 washes, because I do my laundry every day and my clothes does not get so dirty that I should use the indicated amount of the product. I was using 36g scoop for load. Laundry powder. AlmaWin Laundry Detergent Powder for colored linen Concentrate, 1kg. Got his also for free when I was buying an AlmaWin Product basket. Concentrate. Protects fabric fibers and colors. Use: Use the laundry detergent directly with the clothes in the washing machine or in the detergent compartment intended for it. When washing, take into account the instructions of the textile manufacturer. Almawin soap can be used for the initial treatment of the stain, with a natural bile extract to clean the stain. For hand washing, dissolve 25 ml of powder in cold or lukewarm water. Caution! Wash thoroughly after washing. If necessary, choose another rinse cycle. Composition : ≥5% <15% soap (soap and vegetable oil soap), <5% anionic surfactants (vegetable fatty sulfates), nonionic surfactants (flavors of vegetable sugar), aromatics (aromatic oil composition of natural essential oils) , limonene, enzymes (proteases that are not genetically modified). * from organic farming. Other ingredients: Soda, sodium hydrogen carbonate, phosphosilicate, citric acid, sodium citric acid, plant fatty acid glycerides, natural rice starch, lime extract. 100% of ingredients are of natural origin. Warning: S2 Keep out of the reach and sight of children. S46 if swallowed, seek medical advice immediately and show the container or label. Contains limonene, May cause an allergic reaction. Only completely empty packaging to be recycled. That's all for today. I will soon run out of other products. How do you like it more? Do you like when I write an review on single product in a single post, or do you prefer posts where I combine all products I have used in month? Leave a comment.